Say goodbye to cat helmets, sound tracks, art books, and behind the scenes DVDs. They no longer are the bar for collector's editions of games. 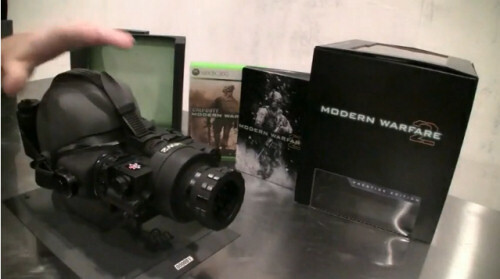 Infinity Ward's Call of Duty: Modern Warfare 2 has set the new baseline with their Prestige Edition of the game. Not only will the box set include the game, an art book, arcade code and some limited edition packaging - it will include real working night vision goggles to spy on your neighbors or keep neighborhood watch for terrorists. FourZeroTwo unboxes the entire set in the latest YouTube video from IW, and it certainly looks quality. There's no word on price for this, but expect it to be one of the most expensive gaming box sets to date.